The Council of Canadians is a national organization that is grassroots in nature. It can be divided into sections in order to make it easier to make sense of the organization as a whole. The public opinion is always first and it is the main responsibility of the local Chapter to listen and take note. That is why it is free to join and give your input into how the broader public is made aware of social issues. It is then the Chapters who help organize events within their city for the broader public. Chapters survive off individual donations, national funding, and partnering with other organizations. The Chapters then send a representative to the Annual General Meeting in order to vote on different bylaw changes and guide the organization. There are four different regions throughout Canada, adding another step in support to the local chapters. Representatives from the local chapters have a Regional Meeting once every year in order to network with other Chapters and get a better idea where the National Organization is heading. There are then campaigners for the main issues that the national office wishes to raise awareness of. Many of these are in the National Website’s Campaigns page as well. Many Chapters get their information and guidance from the campaigners as well as any informational literature that can in turn be handed out to the public. Finally the Board of Directors is made up of individuals, like yourself, from all areas of the country. They look after all of the internal functions of the organization, from paying the staff, looking after the website, and handling other business matters of the organization. If you would like more information regarding the structure of the national organization, go to the national website, mainly the About Us section. Your individual Chapter is organized in a way that allows for inductive, grassroots decision making. 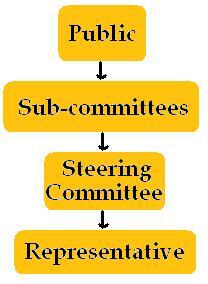 It is made up of sub-committees, the steering committee, and the representative. Like the national office, the public always comes first. They are what guide the local Chapters; Chapters organize their events to the needs and interests of the local public. Sub-committees look at different issues to see the best way to organize events and what issues need more awareness. The steering committee is made up of individuals who meet on a monthly basis and generally make up the organizing part of the Chapter itself. It is made up of the Chair, the Vice-chair, the Secretary, and the Treasurer. The representative for the Chapter is usually, but not always, the Chair. They report back and stay in contact with the national and regional office. This is also the individual who goes to the Annual General Meeting and the Regional Meetings. The person who goes to these meetings may change from time to time, depending on availability and interest.